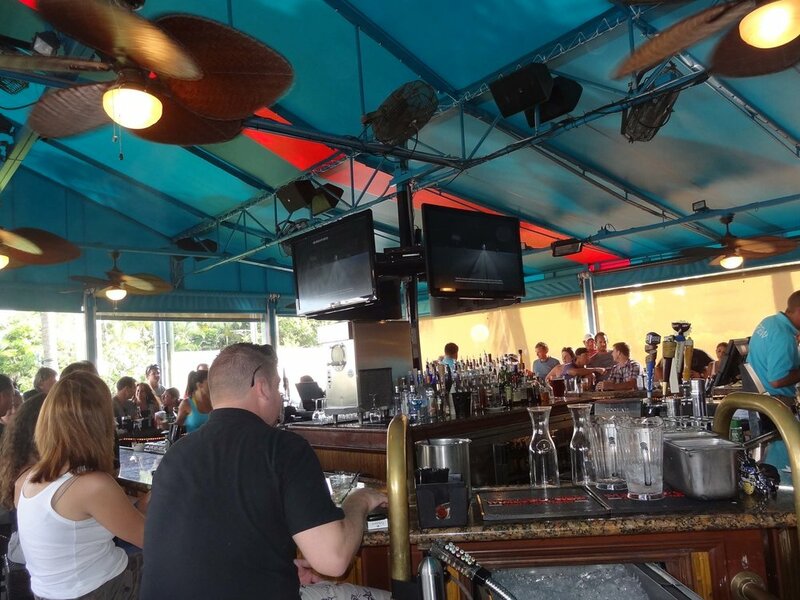 Deck 84 is a Florida beach bar located in Delray Beach. Discover this great Florida beach bar. Music: Live bands on weekends 1:00 p.m.-5:00 p.m.
Tucked away under the Intracoastal Waterway draw bridge in Delray Beach, you will find Deck 84. We were crossing the bridge by foot and heard the band. You know how we love a band. We accessed it from the bridge and decided it was crowded and the people looked happy. So we gave it a try. We were not disappointed. You can catch live music at the Florida beach bar on Saturday and Sundays from 2:00 p.m. to 6:00 p.m. The band was playing great music, like Tom Petty, and the crowd was enjoying the ambiance. You can sit inside or outside a tables or in the bar area. There is a view of the Intracoastal Waterway and the boat traffic. The food is very good. Try the meatloaf. Deck 84 has lots of special things going on daily to draw you in. This Florida beach bar has a constantly changing array of events and promotions to entice you into the restaurant or bar. Every day of the week, there is some kind of an event. There is complementary valet parking Monday through Friday at lunch and Monday through Thursday at dinner time. During Sunday brunch you can Build-Your-Own 20 oz. Bloody Mary at their Bloody Mary Bar featuring more than 20 ingredients! Feel free to bring your well-behaved dog to the bar area of this restaurant. This Florida beach bar is dog friendly.